"If there is paradise on Earth, it is here, it is here, it is here". 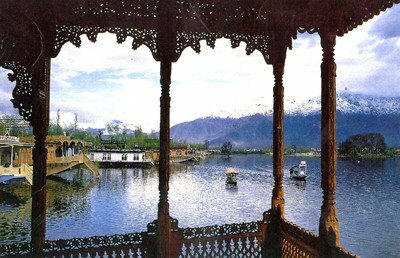 An Urdu poet once summed up the eternal beauty of Kashmir in these lines, just one of many enchanted with this timeless land. 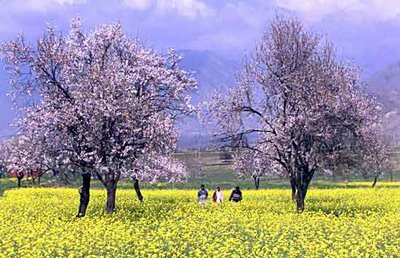 The vale of Kashmir is unique in that nature has endowed Kashmir with exotic beauty - one which is reflected in its picturesque landscapes, lush green forests, beautiful rivers and waterfalls, snow covered mountains, barren cold deserts and a range of exquisite flora and fauna. The northern most part is that of Ladakh which can only be described as the 'The Last Shangri-La' or 'Little Tibet'. Ladakh is home to a number of monasteries and various sects of Buddhism. 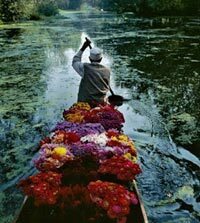 Often compared to Switzerland, Kashmir was once the most the popular honeymoon spot in all of India & a favorite summer retreat of the British Raj. To understand why Kashmir is now more famous as a battleground than paradise on earth one needs to go back to the events of August,1947. In the summer before Partition, each state that comprised India was given the choice to join either India or Pakistan. For the most part (with the exceptions of Punjab & Bengal which were mindlessly bisected) they chose one or the other based on religious grounds - but the princely state of Kashmir was different. The Hindu ruler, Maharajah Hari Singh, whose subjects were 75% Muslim - did not wish to join either country and wanted Kashmir to stay an independent state. Pakistan organized a covert attack on his palace by Pathani tribesman in order to force his hand but he got word of it literally hours before their arrival. The Maharajah contacted Prime Minister Nehru in a panic & subsequently signed a pact to become part of India. He was thus given protection by the Indian government against the Pathans and Kashmir officially became a part of independent India. This seemingly small event has pushed both countries to war three times since then & caused the insurgency that began in 1989. It has resulted in the death of thousands of innocent civilians, the ethnic cleansing of the Kashmiri Pandits who have been forced out of their ancestral homeland and are now refugees in their own country and the desecration of a once proud land. India claims Kashmir as an integral part of it's secular vision & Pakistan wants the people of Kashmir (not a ruler) to choose their future. The UN has been unable to assist in a compromise as both countries refuse to make any concessions. Which side is right is a matter of personal choice but both nations must answer to the tragedy that has befallen this beautiful region and it's people. The music of Kashmir is as varied as the people that populate it. The 1st song is Bhoop from the album 'Call of the Valley'. Released in 1968, it remains the best selling Indian classical music album ever released in India & depicts the day of of a Kashmiri shepherd from morning to night. The album is predicated on the deliciously simple (yet at the time radical) idea of marking the passage of the day with ragas appropriate to the hour. The 2nd song, Ye Kashmir Hai, is from the movie 'Bemisaal' starring Amitabh Bachchan & Rakhee. It is sung by Kishore Kumar & Lata Mangeshkar. I highly recommend the book 'Freedom at Midnight' for more information on this matter as it is one of the most enthralling books based on true events I have ever read. Written by French authors Collins & LaPierre, this book is must reading for any person of South Asian descent. you wax poetic, my friend, and my interest hardly wanes. keep up the journey, I'm enjoying the postcards.